Bundesliga | Big prizes on offer in fixture list competition! On Thursday 29 June the Bundesliga fixture list for the 2017/18 season will be officially released. Click right here to find out when and where the Bundesliga schedule will be released! Who will defending champions Bayern Munich face in the opening game on 18 August? When is the Revierderby between Borussia Dortmund and Schalke? And who will promoted duo Stuttgart and Hannover go up against on their return to the elite? The answers to those questions, and many more besides, will soon be revealed, and you have the chance to get your hands on a number of fantastic prizes once the Bundesliga and Bundesliga 2 schedules are published. The main prize is a trip to the Supercup between Borussia Dortmund and Bayern Munich on 5 August at the Signal Iduna Park, including travel, accommodation and two match tickets. Simply visit schedule.bundesliga.com and take part in our daily competitions. Each day there will be a new question with four multiple-choice options. Simply register using our sign-up form, submit your answer and if you choose correctly you will automatically be included in the main prize draw. Users can take part once every day until 23:59 CEST. 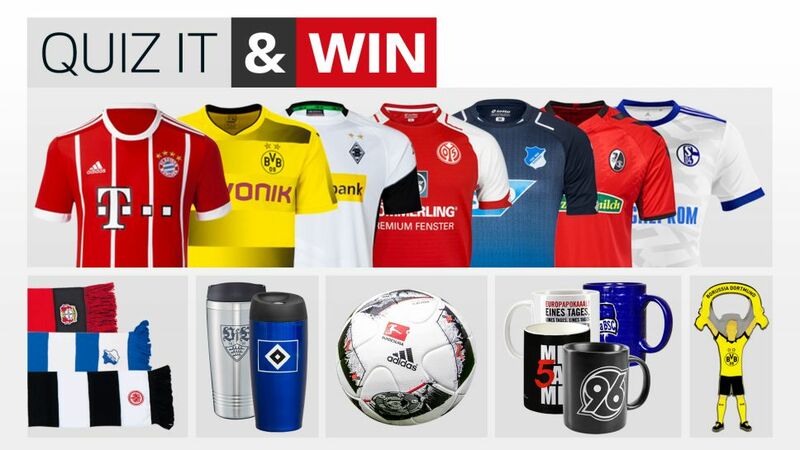 There are plenty of prizes on offer, including shirts and other merchandise from the 18 Bundesliga clubs. The main prize will be drawn from all participants. The more you take part, the better your chances of winning! A trip for two to the Supercup between Borussia Dortmund and Bayern Munich on 5 August at the Signal Iduna Park, including travel, accommodation and match tickets. 1.1 DFL Deutsche Fußball Liga GmbH, Guiollettstraße 44-46, 60325 Frankfurt/Main, Germany, ("DFL") conducts an online competition to celebrate the release of the new matchday schedulefor the season 2017/2018 ("Competition"). Participation in the Competition and how it is conducted are governed by these Terms and Conditions ("Ts&Cs"), which the participant ("User") recognizes as binding upon the User by participating in the Competition. 1.2 The Competition will be conducted from 20 June 2017 until 23:59 (CEST) on 29 June 2017. Participation in the draws for the respective daily prize/s will be possible from 00:00 (CEST) to 23:59 (CEST) each day. Any entries for the Competition received after the respective close for participation will not be considered. 1.3 All Users who answer the daily competition question about the Bundesliga correctly will go into the draw to win one of the respective daily prizes (e.g. fan articles and jerseys of the clubs of the Bundesliga). The quantity and details about the daily prizes can be found in this article. All entries will then go into the draw to win the top prize, which includes two tickets for the Supercup match on 5 August 2017 in the Signal Iduna Park in Dortmund (Germany), including travel from a major airport or train station near the main winner’s residence and accommodation for two nights. 2.1 Only individuals who have reached the legal age of maturity are entitled to participate in the Competition. 2.2 Participation in the Competition is free of charge. 2.3 Participation in the draw for the daily prize/s is possible by answering the daily competition question about the Bundesliga correctly, in conjunction with registering for the Competition by entering the User’s first and last name, email address, country and confirmation of having reached the legal age of maturity. The top prize will be drawn from all entries. The User alone is responsible for the punctual access at the DFL, as well as the accuracy of the User's personal data. 2.4 Any false personal information provided by the User authorizes the DFL to exclude him or her from the Competition. Users who secure an illegal advantage over other Users, or whose entries contain immoral, slanderous, discriminatory, disgusting or other illegal material, or which show or call for legal activities, will also be excluded from the Competition. Automatic computer-generated entries and multiple entries per day to take part in the draw for the respective daily prize/s are not permissible, and will not be considered. The User’s right to participate on several or all days in the draws for daily prizes to increase their chances in the draw to win the top prize remain unaffected. Employees of the DFL and companies affiliated with the DFL within the meaning of §§ 15 et seq. German Stock Corporations Act (Aktiengesetz, "AktG") and the Bundesliga Foundation, employees of licensees, partners and sponsors, contractual partners as well as the respective relatives of these employees are excluded from participation. The DFL can demand return of the prizes that have already been granted in all the above-mentioned situations. 3.1 The winners will be drawn until 7 July 2017 and notified by email. They are required to contact the DFL within two weeks for the top prize (tickets for and travel to the Supercup match 2017) and within four weeks for the daily prizes after the notification has been sent. If the respective winner does not contact the DFL within the respective period of time after the notification has been sent, the respective prize will be forfeited and an alternate winner will be selected at the DFL’s sole discretion. 3.2 The claim for the top prize is also lost if the top prize cannot be redeemed due to reasons which lie solely in the person of the main winner or in the main winner's area of responsibility. 3.3 The claim for the prizes is not transferrable. A cash payout or payout with physical items is excluded. 3.4 The travel included in the top prize must begin and end at the same major airport or train station. The main winner is responsible for ground transportation to/from the airport or the train station at point of origin. The airline will be selected at the sole discretion of the DFL. Once the winner's tickets have been issued, any change fee must be paid by the main winner if they wish to change flights or dates of travel. All other expenses and any incidental costs are at the main winner’s responsibility, including local and ground transportation from/to the airport or the train station, the hotel and the stadium, as well as telephone/internet, meals, room-services charges, parking fees, insurances, visa, and gratuities. The main winner is solely responsible for having any necessary travel documents (e.g. passport, visa etc.). 3.4 In the event that the prizes are redeemed through retailers or other providers, the DFL is entitled to share the contact data of the respective winner with the respective retailer or provider so that they can contact the respective winner. 4.1 The respective winner consents to publication of his or her first name and the first letter of his/her surname, as well as the country in the official tele-media and social media of the DFL. 4.2 The main winner agrees that the DFL or a third party named by the DFL can produce visual and/or audiovisual recordings during the trip. The main winner grants the DFL the exclusive right to exploit these recordings commercially and for non-commercial purposes without any restriction in time and territory either by itself or through licensees and partners of the DFL (i.e. cooperation, media and marketing partners), as well as the clubs of the Bundesliga and the Bundesliga 2. The exploitation can take place in every physical form (especially production and dissemination of all digital and analogue media formats) and every non-physical form (especially broadcast, public communication or accessibility, for example, as download or streaming) in all media and on all platforms. The use is expressly limited in content to showing the main winner in this capacity. 4.3 The DFL will observe the provisions in the law on data protection and data safety. All data entered by the User during registration in the Competition will only be collected, processed and secured for the conduction of the Competition, and deleted afterwards. 5.1 The liability of the DFL is limited in amount to the harm typically foreseeable when concluding the contract in the case of minor negligent violation of primary duties [Kardinalpflichten] (i.e. material duties which must be fulfilled by the DFL and which are of major importance for achieving the purpose of the Competition or which must be complied with by the DFL and which, if violated, can result in endangering achievement of the purpose of the contract). The DFL is not liable for minor negligent violation of other duties. 5.2 The DFL assumes no warranty for defects in substance and/or defects in title with regard to the prizes. The respective winner can only assert warranty claims against the respective supplier. If a prize is provided by a partner, the DFL is also not liable for any insolvency of this partner and the consequences of insolvency. Exclusion of the above liability for defects in substance and/or defects in title on the part of the DFL does not apply if the defect in title or in the item was fraudulently not disclosed by the DFL. 5.3 The above limits and exclusions on liability and warranties do not apply in cases in which liability is mandated by law, especially in the case of culpable injury to life, physical integrity and health or claims under the German Product Liability Act [Produkthaftungsgesetz]. To the extent that the liability of the DFL is excluded or limited, this also applies for the personal liability of corporate bodies, employees, representatives and agents. 6.1 The DFL reserves the right to interrupt or shut down the Competition at any time without stating reasons. Especially reasons involving technology and/or legal matters, as a result of which the Competition can no longer be properly conducted, can be the basis for the end of the Competition. 6.2 Legal recourse is excluded. Only the law of the Federal Republic of Germany applies. 6.3 Place of performance for the Competition is the registered office of the DFL. Head here for all the latest Bundesliga news!